Lina finds solace in her art, meticulously--and at great risk--documenting events by drawing, hoping these messages will make their way to her father's prison camp to let him know they are still alive. It is a long and harrowing journey, spanning years and covering 6,500 miles, but it is through incredible strength, love, and hope that Lina ultimately survives.Between Shades of Gray�is a novel that will steal your breath and capture your heart. Human history contains a great number of tragedies. Often, these are given a footnote, if that in the high school history textbook. While I could go on and on and on about how horrible history textbooks are, I won’t. Instead I will say to you, read Lies My Teacher Told Me by James Loewen. �I mean, how often do you hear about Columbus’s slaughter of the Arawak indigenous peoples. How often do you read about the Armenian genocide? Or what about the Albigensian Crusade? Go look that one up. As humans, we are cruel to each other. Between Shades of Gray by Ruta Sepetys takes on what was essentially a paragraph in my history class notes and turns it a harrowing novel. Between Shades of Gray examines what life was like on a micro scale for someone who had been deported to Siberia for being anti-Soviet, or, enemies of the people. Lina, 15 years old, is a Lithuanian girl who loves art, flirts with boys and has a close relationship with her family. She’s your typical teenage girl, with a dose of sass, living in the early 1940s. Unfortunately the 1940s are a time of turmoil and change. You have Hitler going nuts changing the map as he annexes countries. Stalin is rising to huge amounts of power taking over Eastern Europe. Caught in the cross hairs of these two powerful men are countries like Poland, Lithuania, Ukraine, etc. In the dead of night, the NKVD show up at Lina’s home and deport her family to Siberia for unpatriotic activities. Lina, a 15 year old girl is considered a political criminal, yet she has done nothing to merit that. As her father is a university provost and middle-class, this is considered a crime against the people, a crime the whole family commits merely by their social standing. FRIENDS, it is heart wrenching to see this whole family’s lives ripped apart. The writing in Between Shades of Gray is gorgeous. It’s never overwrought. It’s never cheaply sentimental. Pot shots aren’t taken for the sense of sparking tears from the reader. To me, I felt the writing was an honest portrayal of what people really went through. There was nothing hokey about it. It never felt like a school lesson either. In fact, because the writing is not filled with unnecessary, overly descriptive words, I felt that it was easier to connect with Lina. We get these brief images or rather, flashbacks, of Lina’s previous life interwoven with the current narrative of events. When you see how happy Lina’s life was, and just compare it with life on the klokholz, the collective farm, it’s enough to break your heart. And I know people reading this book will appreciate their own circumstances, which is great. But I think you should also make it not about you. Don’t turn the book into a selfish experience. Instead think about real people, and what they actually went through. Think about THEIR pain. Think about what people are still going through today in Darfur. Think about something besides yourself. The note I want to end on in this review of Between Shades of Gray by Ruta Sepetys is that history is so important to learn about. We keep making mistakes over and over and over. I mean, just look at what goes on in the news. I think the more we try to uncover the past, terrible though it may be, the more we try to not whitewash these incidents, the more we are able to move forward, and hopefully change for the better. Wow! What an absolutely amazing review. You make me want to read this RIGHT NOW. Wow, this book sounds beautiful! 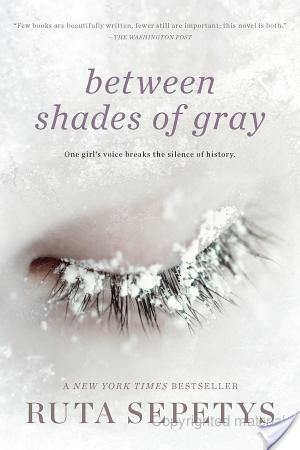 Sad stories are difficult for me to read, but it sounds like I really need to read Between Shades of Gray. I like how you mentioned not turning the book into a selfish experience–I hadn’t really thought about it that way, but you’re completely right! This book sounds gorgeous. I’ve heard nothing but good reviews on it. I am struggling between choosing this to read next and WIther, but this one sounds like a very real, relevant and heartbreaking read. Thanks for your review. I always enjoy stepping into the life of someone else to see what its like to be in a different world than the one I’m so used to. Amazing amazing review. I actually have a copy of this on my bookcase and i’ve been trying to wait until my head can handle something this epically tragic, but now i think i may have to just jump in at the deep end. love this review like woah. Interesting review, April. I agree that I loved the writing in this story. However, I do think it’s unfair to say that people who feel fortunate after reading this book are making it into a selfish experience. Yes, I thought about how lucky I am not to be living in a war torn nation while I was reading this, but I also thought about Libya and how I still need to give money to the IRC (and yes, I understand that the conflicts in this novel and Libya are different, but that’s how my mind works). Sure, thinking about one’s self and good fortune while reading this novel is selfish, but it doesn’t mean that sympathy and a desire to act are absent. Amazingly beautiful review April. I’ve been eyeing this one for a while now, and think I seriously need to make it a priority. I just finished this book last week and I agree with you on everything! I love that you bring up that this isn’t the only horrific historical event that we don’t pay attention to. Okay, so I’ve definitely decided that I need this book. Right away. What a review!! Jen recently posted..6 Month Mini-Blogoversary-Birthday Giveaway! I totally agree! This was such a mind blowing book that I couldn’t stop thinking about it long after I finished it. This book was amazing. The writing is spare, realistic, very dark at some points, but beautifully done. You are there on the train, along with their fears, their courage, and the ability to withstand all that the Russians hand them, and still have hope that this too will end. I was a teenager when this happened, but knew nothing about this until now. This book ranks up with Anne Frank and others of the same genre. it happened at night they took me in my nightgown they knocked on our door so hard. they sed we had 20 mins to get ready mother packed our suitcses ………. we were thrown into a cattle we were squished mother kept reasuring us that they have made a mistake……………they stopped outside a hospital i thought they were going to get a docter for the bald man i asked them and they sed there is a lady on the list who just gave birth there she was with her baby she was thrown in the docter NO dont the baby wont survive but they drove off ………………… we stooped and new people were put on to our cattle a lady and her son a boy my age!